Grassland birds are declining as a consequence of habitat modification, and these declines have generated efforts to determine how birds cope with changes in habitat features, especially in agricultural landscapes. The objective of our study was to examine the relationship between grassland birds and vegetation structure in the Northern Campos of Uruguay. Vegetation variables were sampled on 4 sites that differed in agricultural management: (1) “Crop” site, a combination of annual crops and seeded pastures; (2) “Pasture” site, seeded pastures only; (3) “Native 1” site, natural grasslands under sheep and cattle grazing; and (4) “Native 2” site, natural grasslands grazed by native Pampas deer (Ozotoceros bezoarticus) and cattle. We used multivariate analyses to examine the relationship between bird abundance and vegetation variables. Vegetation structure varied among sites, and most of these differences can be linked to specific management activities typical of each site. Mean vegetation height was greater (and more variable) in cultivated grasslands (Crop and Pasture sites), whereas mean percentage grass contacts (grass cover) was greater in natural grasslands (Native 1 and 2 sites). 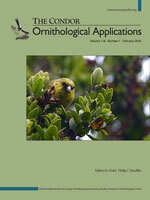 Vegetation variables accounted for a significant amount of variation in bird distribution and abundance (14.8%). Grassland birds were associated most strongly with vegetation height, grass cover, and vegetation patchiness. Some of the species associated with the highest values for these environmental gradients were Dark-throated Seedeater (Sporophila ruficollis), with vegetation height; Pampas Meadowlark (Sturnella defilippii), with grass cover; and Burrowing Owl (Athene cunicularia), with vegetation patchiness. Unlike facultative species, many grassland-specialist birds were associated with characteristic features (i.e. high grass cover) of natural grasslands used by livestock. Others, however, were associated with typical features (i.e. taller vegetation) of cultivated grasslands. Thus, Pampas grassland bird populations would benefit not only from native-grassland preservation efforts, but also from management guidelines for agriculture-dominated lands. Understanding the factors that determine population densities is critical for conserving viable populations of threatened species. Half of the 50 species in the family Cracidae have experienced population declines. We conducted a literature review to explore the relations of population densities of cracids with body size, habitat, season, and hunting. We compiled 103 density data points for 27 species in 37 localities from Mexico to Argentina. There was no correlation between body mass and density. The larger cracines tended to have lower densities than penelopines, but densities in both subfamilies spanned a similar range of values. Intraspecific and interspecific densities varied among sites over 2 orders of magnitude (1–100 birds km−2). Some cracids exhibited plasticity in habitat use, with variable densities among habitats. There is evidence that some species performed local movements related to seasonality in rainfall or resource availability, leading to aggregations around water sources during the dry season or around seasonally abundant food sources. Hunting had a negative effect on population densities, but in some cases low to moderate hunting did not cause a decrease in density in comparison to nonhunted sites. Despite having similar ecologies, densities of cracid species are very variable, and each population seems to respond idiosyncratically to local factors, which requires care if data are extrapolated across populations or species. Future studies that aim to characterize cracid populations for conservation purposes should take into account possible intraspecific density variations related to seasonality, local movements, and habitat heterogeneity. Many migratory bird species, including the American Black Duck (Anas rubripes; hereafter black duck), face challenges to their survival during winter due to potentially limited resources and high energetic demands. These winter processes can be especially important for the population dynamics of migratory species. Despite stabilization of the overall black duck breeding population, historical declines continue for black ducks wintering in the Mississippi Flyway. It remains unclear if declining abundance in this region reflects high winter mortality. We radio-tagged 111 females in the Tennessee National Wildlife Refuge (TNWR), a major wintering area for mid-continent Mississippi Flyway black ducks, from December to February of 2010–2012 to estimate winter survival and investigate factors that may influence survival rates, including body mass, age, hunting period, and weather. Winter survival (0.83–0.85) was greater than or comparable with previous estimates for black duck populations in North America. Generally, birds with greater body mass had higher survival than birds of lesser body mass; a bird 100 g heavier than one of average body mass had 18% greater interval survival. We also found that body mass had a greater influence on survival during late (nonhunting) periods and a more severe winter, when resources potentially were limited. For example, a bird with a body mass 100 g above average had 9% greater interval survival than one of average body mass during the winter of 2010–2011, but in the subsequent milder winter, the heavier bird had similar survival to the bird of average body mass. Our results suggest that winter mortality is not a primary factor contributing to declining abundance of black ducks in the TNWR. If this reflects the general pattern in the Mississippi Flyway, declining regional abundance may be driven by movement patterns or cross-seasonal effects rather than winter mortality. Wetlands constructed or modified by humans (human-influenced wetlands [HIW]) constitute an increasing proportion of wetland habitat in the USA. It is unclear to what extent HIW (e.g., ponds, reservoirs, impoundments, aquaculture sites, and flooded agricultural fields) provide equivalent habitat for wading birds compared with the natural wetlands they are replacing or augmenting. We compared selection of HIW with natural wetlands by Great Egrets (Ardea alba) in 2 regions containing high proportions of wetlands (73% Louisiana [LA], 39% South Carolina [SC]) and similar proportions of HIW (4.3% LA, 4.5% SC). Great Egrets in LA (n = 11) and SC (n = 19) were tracked using satellite transmitters for up to 1 year to assess selection of home ranges and foraging sites. We also compared selection of flooded agricultural fields vs. natural wetlands as foraging sites from aerial surveys of untagged egrets in LA. In SC, tagged birds showed stronger selection for HIW than natural wetlands as foraging sites, driven by use of small man-made ponds (39.9% of foraging observations), but home ranges did not contain a disproportionate area of ponds. In LA, tagged birds showed no overall selection of HIW at either scale, but unmarked egrets showed strong selection for crayfish aquaculture ponds, especially during drawdown. Rice fields provided only a short window of opportunity for foraging Great Egrets and were not selected over nearby natural sites. Despite widespread availability of HIW in the southeastern USA, our results show that natural wetlands continue to provide the majority of foraging habitat for Great Egrets; however, some HIW types (aquaculture and small ponds) may be strongly selected. Estimates of species' vital rates and an understanding of the factors affecting those parameters over time and space can provide crucial information for management and conservation. We used mark–recapture, reproductive output, and territory occupancy data collected during 1985–2013 to evaluate population processes of Northern Spotted Owls (Strix occidentalis caurina) in 11 study areas in Washington, Oregon, and northern California, USA. We estimated apparent survival, fecundity, recruitment, rate of population change, and local extinction and colonization rates, and investigated relationships between these parameters and the amount of suitable habitat, local and regional variation in meteorological conditions, and competition with Barred Owls (Strix varia). Data were analyzed for each area separately and in a meta-analysis of all areas combined, following a strict protocol for data collection, preparation, and analysis. We used mixed effects linear models for analyses of fecundity, Cormack-Jolly-Seber open population models for analyses of apparent annual survival (ϕ), and a reparameterization of the Jolly-Seber capture–recapture model (i.e. reverse Jolly-Seber; RJS) to estimate annual rates of population change (λRJS) and recruitment. We also modeled territory occupancy dynamics of Northern Spotted Owls and Barred Owls in each study area using 2-species occupancy models. Estimated mean annual rates of population change (λ) suggested that Spotted Owl populations declined from 1.2% to 8.4% per year depending on the study area. The weighted mean estimate of λ for all study areas was 0.962 (± 0.019 SE; 95% CI: 0.925–0.999), indicating an estimated range-wide decline of 3.8% per year from 1985 to 2013. Variation in recruitment rates across the range of the Spotted Owl was best explained by an interaction between total winter precipitation and mean minimum winter temperature. Thus, recruitment rates were highest when both total precipitation (29 cm) and minimum winter temperature (−9.5°C) were lowest. Barred Owl presence was associated with increased local extinction rates of Spotted Owl pairs for all 11 study areas. Habitat covariates were related to extinction rates for Spotted Owl pairs in 8 of 11 study areas, and a greater amount of suitable owl habitat was generally associated with decreased extinction rates. We observed negative effects of Barred Owl presence on colonization rates of Spotted Owl pairs in 5 of 11 study areas. The total amount of suitable Spotted Owl habitat was positively associated with colonization rates in 5 areas, and more habitat disturbance was associated with lower colonization rates in 2 areas. We observed strong declines in derived estimates of occupancy in all study areas. Mean fecundity of females was highest for adults (0.309 ± 0.027 SE), intermediate for 2-yr-olds (0.179 ± 0.040 SE), and lowest for 1-yr-olds (0.065 ± 0.022 SE). The presence of Barred Owls and habitat covariates explained little of the temporal variation in fecundity in most study areas. Climate covariates occurred in competitive fecundity models in 8 of 11 study areas, but support for these relationships was generally weak. The fecundity meta-analysis resulted in 6 competitive models, all of which included the additive effects of geographic region and annual time variation. The 2 top-ranked models also weakly supported the additive negative effects of the amount of suitable core area habitat, Barred Owl presence, and the amount of edge habitat on fecundity. We found strong support for a negative effect of Barred Owl presence on apparent survival of Spotted Owls in 10 of 11 study areas, but found few strong effects of habitat on survival at the study area scale. Climate covariates occurred in top or competitive survival models for 10 of 11 study areas, and in most cases the relationships were as predicted; however, there was little consistency among areas regarding the relative importance of specific climate covariates. In contrast, meta-analysis results suggested that Spotted Owl survival was higher across all study areas when the Pacific Decadal Oscillation (PDO) was in a warming phase and the Southern Oscillation Index (SOI) was negative, with a strongly negative SOI indicative of El Niño events. The best model that included the Barred Owl covariate (BO) was ranked 4th and also included the PDO covariate, but the BO effect was strongly negative. Our results indicated that Northern Spotted Owl populations were declining throughout the range of the subspecies and that annual rates of decline were accelerating in many areas. We observed strong evidence that Barred Owls negatively affected Spotted Owl populations, primarily by decreasing apparent survival and increasing local territory extinction rates. However, the amount of suitable owl habitat, local weather, and regional climatic patterns also were related to survival, occupancy (via colonization rate), recruitment, and, to a lesser extent, fecundity, although there was inconsistency in regard to which covariates were important for particular demographic parameters or across study areas. In the study areas where habitat was an important source of variation for Spotted Owl demographics, vital rates were generally positively associated with a greater amount of suitable owl habitat. However, Barred Owl densities may now be high enough across the range of the Northern Spotted Owl that, despite the continued management and conservation of suitable owl habitat on federal lands, the long-term prognosis for the persistence of Northern Spotted Owls may be in question without additional management intervention. Based on our study, the removal of Barred Owls from the Green Diamond Resources (GDR) study area had rapid, positive effects on Northern Spotted Owl survival and the rate of population change, supporting the hypothesis that, along with habitat conservation and management, Barred Owl removal may be able to slow or reverse Northern Spotted Owl population declines on at least a localized scale. Hourly or daily counts of animals during migration are used to assess change in population status. However, due to financial and logistical constraints, it is sometimes not possible to sample the entire migration, resulting in an unknown impact on accuracy and precision of estimated trends. Using simulated migration counts of 3 raptor species, commonly detected Sharp-shinned Hawks (Accipiter striatus), rarely detected Merlins (Falco columbarius), and super-flocking Broad-winged Hawks (Buteo platypterus), we used a hierarchical modeling framework to test whether sampling effort influenced accuracy and precision of trends. We subsampled simulated datasets in various ways: weekends only; a random sample of 40%, 60%, or 80% of the migration; or the first 25%, 50%, or 75% of the migration. Bias in trend estimates and probability of error (estimating a false but significant trend) varied little with sampling effort for the common and rare species, which suggests that for these species, sampling only a small subset of the migration will not increase the probability of drawing false inference from the data. However, when counts of the super-flocking species were highly variable among days, trends were strongly positively biased when the first 25% of the migration was sampled, and probability of error increased with sampling effort. For all species, probability of detecting a significant and accurate trend also improved with sampling effort, but only exceeded 80% for common and rare species when a majority of the migration was sampled. Increasing sampling effort is recommended to improve power of trend analyses for common and rare species, but for super-flocking species, randomly sampling a subset of observation days throughout the migration can minimize error, but at the expense of a ~22–25% reduction in power using 20-year datasets. For species with this pattern, other methods to improve power, such as combining data across sites, should be considered. Estimating the climatic and habitat factors that affect animal movement patterns (e.g., migration, dispersal, site fidelity) is informative for management and conservation. Juvenile Greater Sage-Grouse (Centrocercus urophasianus) have been identified as having a significant influence on population growth, but relatively little is known about factors that influence survival, movement, and the potential interrelation between the two. Movement out of fall habitat has been suggested to influence the survival of juvenile Greater Sage-Grouse. We reconceptualized the nest survival model (equating movement out of a focal area with failure of a nest) to extend its use to movement data on juveniles in south-central Utah. We found that juveniles' seasonal movements were affected by a linear trend in time (β = −0.655, 95% confidence interval [CI]: −1.049 to −0.26) and by precipitation (β = −3.718, 95% CI: −6.687 to −0.749), with an interaction between the parameters (β = 0.360, 95% CI: 0.002–0.718). In the absence of precipitation, the probability of movement increased weekly through time (within a year). Weekly precipitation increased the probability of movement in earlier weeks, but the effect of precipitation attenuated in later weeks (i.e. interaction parameter). The precipitation was likely non-accumulating snowfall, given the observed below-freezing temperatures. Our results suggest that changes in precipitation (mainly snowfall) that result from climate change could influence the timing and duration of seasonal movements (i.e. population-level time to complete movement) in migratory populations of Greater Sage-Grouse. Furthermore, our results demonstrate the utility of the nest survival model for evaluating the factors that affect animal movements with “ragged” data. Limited resources for biodiversity conservation demand strategic science-based recovery efforts, particularly on islands, which are global hotspots of both endemism and extinction. The Akikiki (Oreomystis bairdi) and the Akekee (Loxops caeruleirostris) are critically endangered honeycreepers endemic to the Hawaiian island of Kauai. Recent declines and range contraction spurred investigation of the habitat characteristics influencing range-wide occupancy of these species. We surveyed Akikiki and Akekee and habitat covariates within 5 study areas on the Alakai Plateau of Kauai along a gradient of forest conditions. Occupancy rates for both species increased from west to east along the plateau (Akikiki: ψ = 0.02 ± 0.07 to 0.55 ± 0.21; Akekee: ψ = 0.03 ± 0.10 to 0.53 ± 0.33), but were low throughout the ranges of both species. Canopy height was positively correlated with occupancy for both species, which suggests the damage done by hurricanes in 1982 and 1992 may be one factor restricting these birds to the most intact forest remaining. Vegetation surveys revealed several key differences in forest composition and structure between areas, indicative of broader changes occurring across the plateau. Invasive plants such as Himalayan ginger (Hedychium gardnerianum) were dominant in the western portion of the plateau, where there was a corresponding decline in native plant cover. Conversely, ground disturbance by feral ungulates was higher in more eastern native-dominated areas. These results highlight the need to protect habitat in the regions where Akikiki and Akekee occupancy is highest, and restore habitat in other parts of their range. These actions should occur in concert with the mitigation of other known threats to Hawaiian honeycreepers such as avian disease. Without significant investment to address these threats and protect suitable habitat for these species, it is unclear how long these birds will persist. Miniaturized data loggers have revolutionized the study of animal movement. However, data obtained from tagging could be compromised by impacts on animal welfare and behavior. We evaluated short-term (activity budgets, foraging trip metrics, overall dynamic body acceleration [ODBA] of flying, wingbeat frequency, adult mass, and nestling mass) and long-term metrics (breeding success and survival) for breeding female Black-legged Kittiwakes (Rissa tridactyla) tagged with both GPS and accelerometer tags (5.2% of body mass), birds tagged with only accelerometers (1.0% of body mass), and untagged birds. Breeding success, survival, adult mass, and nestling mass were not affected by tagging, and there were no differences in trip metrics, ODBA, and flapping frequency for birds tagged with GPS and accelerometer packages vs. only accelerometers. However, accelerometry revealed that, when tagged for 3 days with GPS and accelerometer tags, kittiwakes reduced the amount of time spent flying by 30%. Impacts of short-term tag deployments were detected by measuring metrics over the same short timescale, rather than through measurement of long-term metrics. We suggest that tagging birds alters their behavior, but that such effects may not be detected using coarse-scale measures, such as reproductive success, survival, and body mass, due to behavioral accommodation. We recommend that researchers examine, or at least take into consideration, behavioral changes that may be associated with tagging, even if there are no clear effects on fitness or condition measures. Bicknell's Thrush (Catharus bicknelli) is a threatened species that inhabits high-elevation spruce–fir forests in the northeastern United States. Bicknell's Thrush populations are predicted to shift upslope in response to global warming, leading to local extinctions on mountains that lack the elevational extent to accommodate such shifts. However, biotic interactions may influence how montane species respond to changing abiotic conditions. In territorial songbirds, for example, aggression from dominant low-elevation species has been hypothesized to combine with warming temperatures to “push” populations of subordinate montane species upslope at a faster rate than in the absence of interspecific aggression. This “push” hypothesis could apply to Bicknell's Thrushes: the related Swainson's Thrush (Catharus ustulatus) inhabits lower elevations, Bicknell's Thrushes are largely confined to mountaintops, and interspecific aggression by Swainson's Thrushes toward Bicknell's Thrushes has been anecdotally reported. We used reciprocal playback experiments to test whether patterns of interspecific aggression in Swainson's and Bicknell's thrushes along an elevational gradient in the Adirondack Mountains were consistent with the “push” hypothesis. We found weak asymmetrical interspecific aggression: Some Swainson's Thrush individuals at high elevations where the 2 species co-occurred responded aggressively to Bicknell's Thrush playback, and Bicknell's Thrushes did not respond aggressively to Swainson's Thrush playback. While Swainson's and Bicknell's thrushes appeared to regularly occupy overlapping home ranges, asymmetrical interspecific aggression from a lower-elevation species is consistent with the “push” hypothesis and suggests that interspecific aggression from Swainson's Thrushes may be a factor limiting Bicknell's Thrush populations in the Adirondack Mountains. More broadly, this case example supports the recent call to incorporate biotic interactions in models that predict montane species' responses to climate change. Fire suppression in southern Appalachian pine–oak forests during the past century dramatically altered the bird community. Fire return intervals decreased, resulting in local extirpation or population declines of many bird species adapted to post-fire plant communities. Within Great Smoky Mountains National Park, declines have been strongest for birds inhabiting xeric pine–oak forests that depend on frequent fire. The buildup of fuels after decades of fire suppression led to changes in the 1996 Great Smoky Mountains Fire Management Plan. Although fire return intervals remain well below historic levels, management changes have helped increase the amount of fire within the park over the past 20 years, providing an opportunity to study patterns of fire severity, time since burn, and bird occurrence. We combined avian point counts in burned and unburned areas with remote sensing indices of fire severity to infer temporal changes in bird occurrence for up to 28 years following fire. Using hierarchical linear models that account for the possibility of a species presence at a site when no individuals are detected, we developed occurrence models for 24 species: 13 occurred more frequently in burned areas, 2 occurred less frequently, and 9 showed no significant difference between burned and unburned areas. Within burned areas, the top models for each species included fire severity, time since burn, or both, suggesting that fire influenced patterns of species occurrence for all 24 species. Our findings suggest that no single fire management strategy will suit all species. To capture peak occupancy for the entire bird community within xeric pine–oak forests, at least 3 fire regimes may be necessary; one applying frequent low severity fire, another using infrequent low severity fire, and a third using infrequently applied high severity fire.